Surviving seedling from lasted year. Very nice! Do you leave them out all winter, or do you take them indoors and grow them under lights? Maybe you have a greenhouse? I'm not sure I could get one to perform so nicely here in Oregon! Kisal, i don't have a greenhouse(a real one anyway). I have a hoop house but i only store tropical there like brugmansia and few plumeria and others. The DR, i bring in the house during winter, zero water at all or they will rot. WOW, Those are incredible! Here I am trying to get mine past a few leaves, and your's are growing like crazy! You must really have the touch for them. Congrats on such beautiful plants! Green Mantis wrote: WOW, Those are incredible! Here I am trying to get mine past a few leaves, and your's are growing like crazy! You must really have the touch for them. Congrats on such beautiful plants! thanks, I don't water them often, they prefer very dry rather than wet always. They also prefer full sun. The plant exudes a highly toxic sap which is used by some peoples, such as the Akie and Hadza in Tanzania, to coat arrow-tips for hunting. I guess not for homes with young children and pets unless you can keep them safely away from the plant. That's probably what's wrong with mine. I can't keep it on the windowsill. We need a new window, that one is drafty. At least the one were it could go. Have to get that fixed before fall! Or maybe asap!!! Then I can get it in the sun soon!!!! Thanks for the tip! Thanks "applestar" for nice comments. I have two chihuahua, 7 yrs. old and 6 months, the pup is very naughty always want to eat everything and jumping trying to get to my plants. Have to put them high enough. Home Depot . 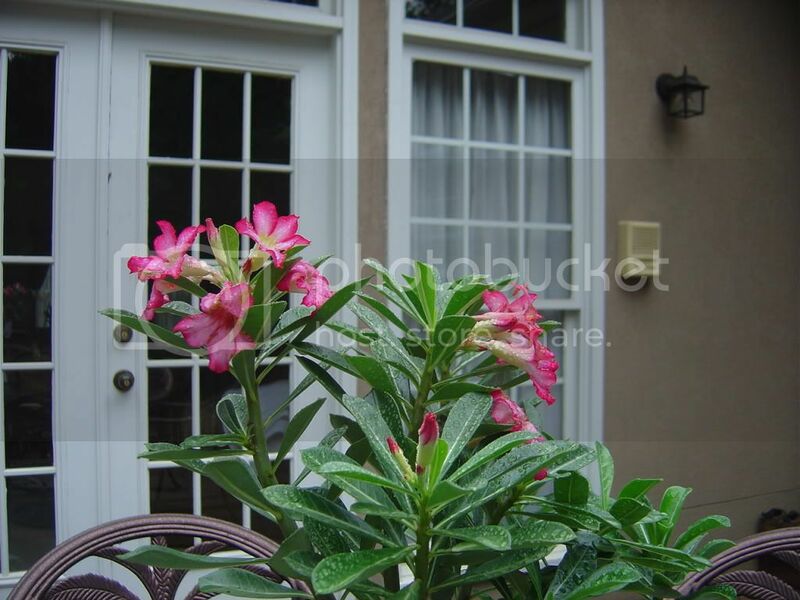 Lowe's, Pikes and sometimes grocery store has Desert Rose plant that are blooming already, try to get one or two. There very easy to care for. Green Mantis wrote: :( That's probably what's wrong with mine. I can't keep it on the windowsill. We need a new window, that one is drafty. At least the one were it could go. Have to get that fixed before fall! Or maybe asap!!! Then I can get it in the sun soon!!!! Thanks for the tip! If they are grown from seeds get them as muck sun light as you can, forget the watering they rot so fast. Let them dry up, don't worry the seedling will be okay. Don't fertilize them too, they can get their nutrient from the soil while their babies. It is normal to loose the leaves in winter but they bounce back once temp goes up around 65 degrees and above. 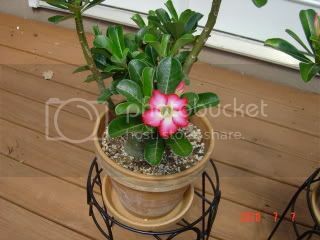 When I first got my desert rose, it was from Wal-Mart. they had a few in there, and I didn't know what they were. But mine only had 2 dead leaves on it. Since it has s l o w l y grown a few then dropped them, then grown a few more. But nothing like yours--which all I can say is WOW to! but as I read what you are doing I am learning a LOT. I now realize, mine was getting drafts, and it isn't warm enough in here. WE are getting new windows before fall, so that should?? I hope, make a huge difference! We don't see these plants very often here. Had I realized what they were I would have bought the last one that was there, at the time too. But when I did find out what they were it was gone. At least now I know. But have never seen any as hardy and lovely as yours! You do have the TOUCH!!!! Keep up the good work! Last year i also found Desert Rose at Wal-Mart, they were in clearance so i grab one since they were two plant in one pot. I never did do anything to them until two weeks ago. I finally got motivated to separate those two plant and give them individual pot and new soil of their own. Never water them after re-potting and just put it in full sun. They are doing good and growing new leaves. I will take pictures of those two i' m talking about later on. 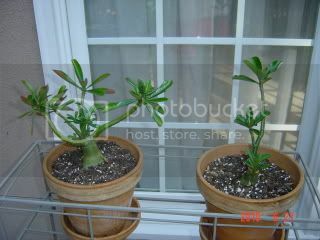 They are very easy to grow from seeds also and cheap buying it from adenium sellers. Do google search on adenuim seed sellers. I bought from "adenuim_ko". Oh my Goodness, Now you are really making me wonder what you are doing so right???? They are gorgeous. Mine sits here with a few leaves!!!! I have to get new windows and get it in the sun, (when we ever get any!!!) I just can't believe your's! PLEASE enjoy your's for me too LOL!!! My desert rose is inside. But, it is only flowering a bit. It is only having 4 or 5 flowers. It doesn't look like my dr will have any more coming soon. Is there a way to get more blooms since I think they are so nice?